Jeremy Renner does a great job convincing you of his pain and desire for justice. Elizabeth Olsen seems slightly too young for this role but has an overall good performance. 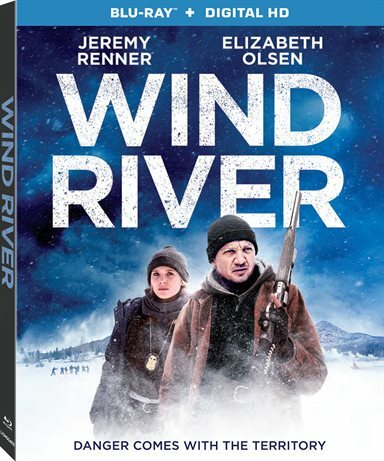 Wind River takes place on a tight-knit Indian Reservation called Wind River where we are introduced to Cory Lambert (Jeremy Renner; The Bourne Legacy), a wildlife officer and outdoor aficionado. While out tracking, he discovers a frozen teenage girl lying in the snow. She is bloodied and barefoot, so it is assumed by Cory and the police officer that she escaped from a bad situation - lungs bursting while trying to get away. You are able to tell by the two men's expression that they know this young girl, who you later find out, is a friend's daughter. Because it's a potential homicide, a woman from the FBI, Jane Banner (Elizabeth Olsen; Godzilla), is sent to assist on the case. She is young, inexperienced and doesn't know anything about the outdoors – a very important factor in solving the case. Cory is very detail oriented and devoted to solving the murder, leading Jane to wonder what motivates his passion for helping her. We later find out that his daughter was killed in a similar manner, tearing apart his life and marriage. Jeremy Renner does a great job convincing you of his pain and desire for justice. We see him so often as an action star but even in those roles, he has an intense presence and the ability to convey much emotion in all of his roles. Elizabeth Olsen seems slightly too young for this role but has an overall good performance. She has also been able to pull of varied roles, always with an excellence that seems to surpass her years. She exudes a certain strength and self-confidence that comes across clearly in her performances. Based on true events, this story is a chilling thriller that sheds a light on a real issue: the lack of statistics for missing Native American women. The movie is impactful and leaves an impression long after watching it, exposing the issues and crime on forgotten Indian Reservations. The Blu-ray video quality is the standard 1080p high definition video with an aspect ratio of 2.39:1 that truly showcase the sweeping vistas of the snow Wyoming planes. The white snow is so crisp you want to reach out and grab some of it in your fist, fully expecting to feel the dampness and cold as it transforms beneath your fingers. The DTS-HD Master Audio 5.1 is superbly subtle in this film, especially when Lambert is alone in the wilderness. While one may think they are only listening to silence, the audience can hear mild undertones of nature in the background. This soundtrack truly envelopes the viewer in this cold and isolated world. Besides the Digital download, the set only offers two extras, which is a little disappointing. The Behind the scenes video gallery offers some stunning photos but the deleted scenes don't offer much in the way of storyline impact. While you don't feel completely satisfied with the ending, they do solve the murder, bringing closure to the people involved in the case and the murdered girl's family. The film is well done in most aspects and tells a riveting story. Download Wind River from the iTunes Store in Digial HD. For more information about Wind River visit the FlickDirect Movie Database.